If you've been here before then you know I am slightly obsessed with skincare. During the winter most people's skin, including mine, becomes dry, and I've been thinking a lot about moisturizers because of that. Since this time of year is the most important time of year to use moisturizer I thought it was the perfect time to do another installment of my 'The Best' Series with facial creams. Finding the right moisturizer for your face can be tricky because there are so many different skin types and countless options on the market. 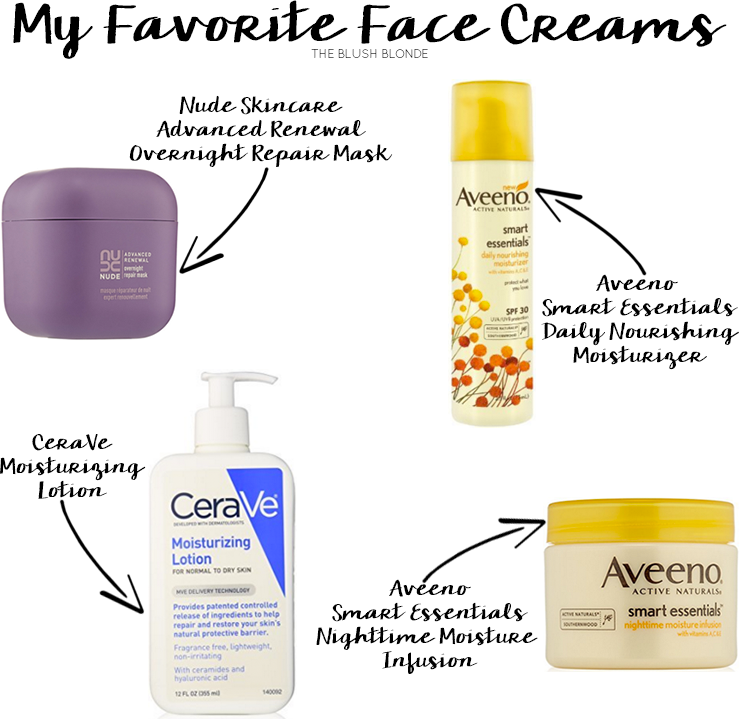 To help you with choosing the right facial moisturizer for your skin I have for you not only my favorite face creams, but recommendations from my friends with the most beautiful skin, too. I've recently started using this because my skin has been incredibly dry. This overnight mask is packed with fig, honey, cupuaçu butter, essential omegas six and nine, and more to soften, repair, and moisturize your skin. It makes my skin feel amazing every time I put it on and it has really helped with my incredibly dry skin. I've been using this moisturizer forever and it definitely has holy grail status for me. It's lightweight, yet moisturizing and smells really good. It also protects your skin from the sun with SPF 30 and works really well under makeup. I used this for years as my nighttime moisturizer when my skin was more combination (now it's desert dry) and I loved it. It doesn't irritate skin and restores its protective barrier. This ultra rich moisturizer works to really hydrate skin while you sleep. It uses Southernwood and vitamins to replenish skin's moisture barrier and you wake up to beautiful restored skin. Sam just started using this and says, "I love it because it's really lightweight and the moisture seems to last throughout the day. Also you don't need a lot of product to see results!" This is Kristen's favorite moisturizer because it is "very hydrating, but it doesn't leave your face feeling greasy." Dana says, "I swear by this moisturizer because it doesn't make my oily skin any oilier, and it truly does brighten my skin! It is also the perfect 'base' for makeup; my foundation goes on noticeably smoother since I started using this product." Jordyn says, "Putting it on after I get out of the shower is seriously my favorite part of my beauty routine. 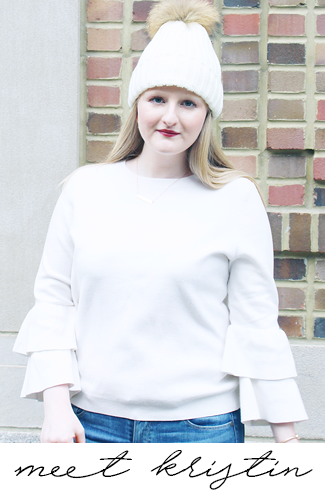 I have sensitive combination skin that is easily irritated by products, but I've never had a bad experience with anything by Kate Somerville. My skin never feels dry or oily, it's the perfect amount of moisture for summer, winter, and all the seasons in between." A new favorite of Lia's she says, "I like that it makes my face soft without looking oily by the end of the day, which is a big deal because I tend to look super sweaty by the end of the day with other moisturizers." Shannon suffers from Rosacea and loves this moisturizer because "it's a really gentle line that is made for people with Rosacea. It has probiotics in it and helps to soothe my skin when my redness flares up." 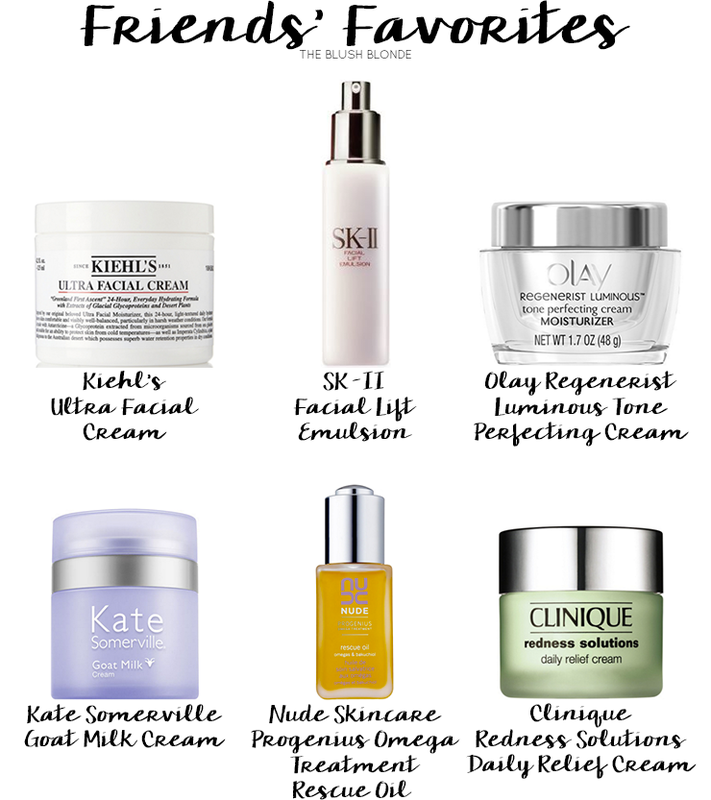 What is your favorite facial cream? Great review! Love how you did these collages! Aveeno is the best! For the price, I just haven't found anything better! I've heard great things about Kiehl's; I'll have to try it. Also, I love Aveeno products! My dermatologist recently recommended the CerVe to me and I'm loving it! !